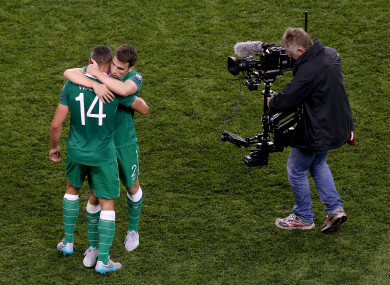 Jon Walters and Seamus Coleman embrace after a Euro 2016 qualifier against Georgia. IRISH CAPTAIN SEAMUS Coleman has hailed the retiring Jon Walters as an “inspiration” for both erstwhile teammates and future Irish stars. 35-year-old Walters announced his retirement on social media earlier today, forced to call time on his career because of an Achilles injury. Speaking at the pre-match press conference ahead of Ireland’s Euro 2020 qualifier against Gibraltar, Coleman paid a rich tribute to Walters. “As long as he and I have been in the squad, he has been nothing short of an example to all of us. The pride: every time he has played for his country he has been an inspiration to all of us. Walters scored 14 times in 54 appearances for Ireland, and messaged Mick McCarthy last week to ask were it possible for him to visit the squad in Abbottstown this week. McCarthy phoned back to invite him in and learned of Walters’ decision. Walters told the rest of the Irish players in camp this week. “It is sad to see him go. It happens to all of us. He was an inspirational player for Ireland and it’s sad when you lose those kinds of players”, said McCarthy. “It is sadder still that it’s for an injury. I wish him well in whatever he chooses to do. “I’ve known for the best part of a week. I’m sad I never had a chance to work with him. He is always someone I admired, and I think he has been inspirational for Ireland and for any club he has played for. Of Walters’ 14 goals, his double against Bosnia in the second leg of the Euro 2016 play-off were arguably the most important. “Unfortunately he got injured before the Euros in 2016 so it didn’t go as well as he would have liked”, said Coleman, “but I feel he nearly carried us there, the night he scored two against Bosnia. Email “'Every time he has played for his country he has been an inspiration to all of us'”. Feedback on “'Every time he has played for his country he has been an inspiration to all of us'”.